Since its founding, the Walt Disney Company has made music a cornerstone of virtually every part of its business. From animated feature films to theme parks, music has always been there to help tell the story and make the magic. 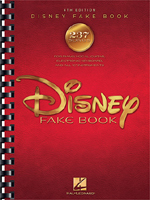 This fourth edition features even more Disney favorites, including hits from their most recent movie and television releases. 240 songs in all, including: The Bare Necessities  Be Our Guest  Beauty and the Beast  Can You Feel the Love Tonight  Circle of Life The Climb  Colors of the Wind Do You Want to Build a Snowman?  A Dream Is a Wish Your Heart Makes  For the First Time in Forever  Go the Distance Happy Working Song  He's a Pirate  How Do You Know?  I See the Light  Immortals  King of New York  Lava  Let It Go The Parent Trap  Part of Your World  A Pirate's Life  Reflection  Seize the Day  Some Day My Prince Will Come  True Love's Kiss  Under the Sea  When I See an Elephant Fly  When She Loved Me  When Will My Life Begin?  When You Wish Upon a Star A Whole New World  Winnie the Pooh  Written in the Stars  You Are the Music in Me  You'll Be in My Heart  Zip-a-Dee-Doo-Dah  and many more.